The anterior cruciate ligament (ACL) is a band of dense connective tissue which courses from the femur to the tibia. The ACL is a key structure in the knee joint, as it resists anterior tibial translation and rotational loads. It runs inferiorly, medially and anteriorly. 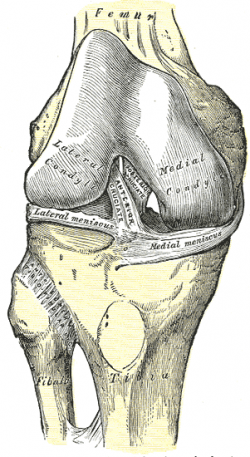 Anterior to the intercondyloid eminence of the tibia, being blended with the anterior horn of the medial meniscus. The tibial attachment is in a fossa in front of and lateral to anterior spine, a rather wide area from 11 mm in width to 17 mm in AP direction. The ACL has a microstructure of collagen bundles of multiple types (mostly type I) and a matrix made of a network of proteins, glycoproteins, elastic systems, and glycosaminoglycans with multiple functional interactions. There are two components of the ACL, the smaller anteromedial bundle (AMB) and the larger posterolateral bundle (PLB), named according to where the bundles insert into the tibial plateau. The anteromedial bundle is tight in flexion and the posterolateral bundle is tight in extension. In extension both bundles are parallel; in flexion the femoral insertion site of the posterolateral bundle moves anteriorly, both bundles are crossed, the anteromedial bundle tightens and the posterolateral bundle loosens. With the knee extended, resistance to anterior translation of the tibia, Lachmans Test, is by the bulky posterolateral bundle. With the knee flexed, resistance to anterior translation of the tibia, the Anterior Drawer Test, is by the anterior medial bundle. Rupture of the posterolateral bundle causes increase in hyperextension, anterior translation (extended knee), increase in external and internal rotation (knee extended), and increases in external rotation with the knee in mid flexion; Rupture of the anteromedial bundle causes anterolateral instability with an increase in anterior translation in flexion, minimal increase in hyperextension, and minimal rotational instability. The ACL provides approximately 85% of total restraining force of anterior translation. It also prevents excessive tibial medial and lateral rotation, as well as varus and valgus stresses. To a lesser degree, the ACL checks extension and hyperextension. Together with the posterior cruciate ligament (PCL), the ACL guides the instantaneous center of rotation of the knee, therefore controlling joint kinematics. While the anteromedial bundle is the primary restraint against anterior tibial translation, the posterolateral bundle tends to stabilize the knee near full extension, particularly against rotatory loads. ↑ Wheeless, C,R. Wheeless' Textbook of Orthopaedics. http://www.wheelessonline.com/ortho/anatomy_of_acl Accessed 8/1/12. ↑ 3.0 3.1 3.2 Kennedy, J. C., Alexander, I. J., Hayes, K. C. (1982). Nerve supply of the human knee and its functional importance. Am J Sports Med, 10(6), 329-335. ↑ 4.0 4.1 4.2 Haus, J., Halata, Z. (1990). Innervation of the anterior cruciate ligament. Int Orthop, 14(3), 293-296. ↑ 5.0 5.1 Hogervorst, T., Brand, R. A. (1998). Mechanoreceptors in joint function. J Bone Joint Surg Am, 80(9), 1365-1378. ↑ 6.0 6.1 Konishi, Y., Fukubayashi, T., Takeshita, D. (2002). Possible mechanism of quadriceps femoris weakness in patients with ruptured anterior cruciate ligament. Med Sci Sports Exerc, 34(9), 1414-1418. ↑ Konishi, Y., Suzuki, Y., Hirose, N., Fukubayashi, T. (2003). Effects of lidocaine into knee on QF strength and EMG in patients with ACL lesion. Med Sci Sports Exerc, 35(11), 1805-1808. ↑ Arnoczky, S. P. (1983). Anatomy of the anterior cruciate ligament. Clin Orthop Relat Res(172), 19-25. ↑ 10.0 10.1 Scapinelli, R. (1997). Vascular anatomy of the human cruciate ligaments and surrounding structures. Clin Anat, 10(3), 151-162. ↑ Arnoczky, S. P., Rubin, R. M., & Marshall, J. L. (1979). Microvasculature of the cruciate ligaments and its response to injury. An experimental study in dogs. J Bone Joint Surg Am, 61(8), 1221-1229. ↑ 12.0 12.1 Petersen, W., Tillmann, B. (1999). Structure and vascularization of the cruciate ligaments of the human knee joint. Anat Embryol (Berl), 200(3), 325-334. ↑ Giori, N. J., Beaupre, G. S., Carter, D. R. (1993). Cellular shape and pressure may mediate mechanical control of tissue composition in tendons. J Orthop Res, 11(4), 581-591. ↑ Duthon VB, Barea C, Abrassart S, Fasel JH, Fritschy D, Ménétrey J. Anatomy of the anterior cruciate ligament. Knee Surg Sports Traumatol Arthrosc. 2006 Mar;14(3):204-13. Epub 2005 Oct 19. ↑ Amis AA, Dawkins GP. Functional anatomy of the anterior cruciate ligament. Fibre bundle actions releated to ligament replacements and injuries. JBJS. Vol 73-B. (2) 1991. p 260-267.